How does rais generate a return for our customers? Typically it boils down to time-savings and improved marketing campaign execution that generates incremental revenue. One of the ways we generate incremental revenue is through increased repeat business. For the vast majority of commerce businesses that sell direct to consumers, customer acquisition is expensive and hard. Hanging onto these customers and getting more repeat business from them only improves the average lifetime value of a customer increases putting less strain on the cost of acquisition. Many argue that a disproportionate amount of time, effort and money is spent on acquiring customers and not looking after them. Time is the biggest enemy here, which is why rais has been useful to our customers in the way it automatically enables them to, in turn, talk to their existing customers in a more relevant way. This gets more repeat orders. So we decided to look at how our customers' repeat rates have gone up since we’ve started working with them. This chart shows the change in repeat rate in percentage points. So If a repeat rate went from 15 percent to 18 percent the percentage point increase is 3. We calculate repeat rate in a very simple way. We take a time period and count how many customers bought during that time period. We then count how many customers bought two or more times within the same time period; repeat customers. We express divide this count of repeat customers into the count of all customers and that provides us with a repeat rate. We then do the same thing for a comparative period from the previous year, prior to when our customer started using rais. This removes any seasonal effects. All of the customers in the graphs above have used rais to create more targeted marketing campaigns, predominantly through email marketing. The incremental sales revenue generated by these 6 customers during the study time periods was £227,664. The cost of rais for these businesses, over the study time periods was £10,188. 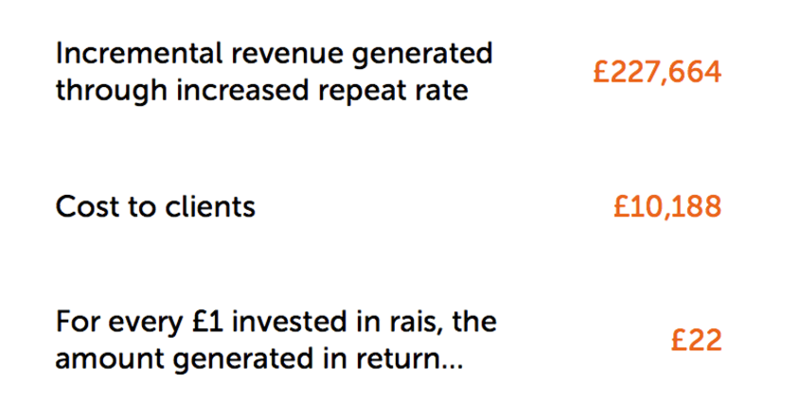 So rais has helped generate sales revenue, 22 times more than the cost. So for every £1 spent on rais, £22 was generated in topline sales.